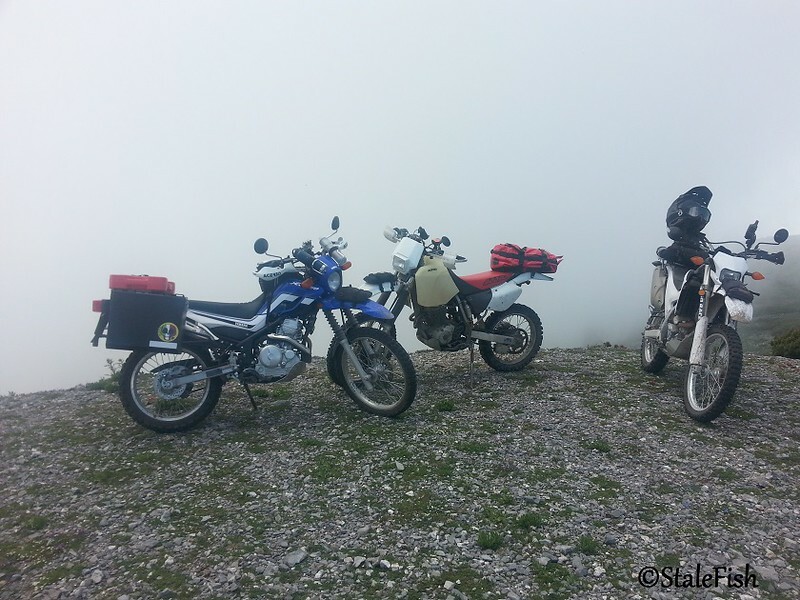 Discussion in 'Ride Reports - Day Trippin'' started by PDublYu, May 28, 2015. On the eve of my round the world trip departure (okay, it's still about 6 weeks away, but that's starting to seem really close), I met up with five other guys from around Texas and rode to Galeana, Mexico for some relaxing off-road touring and a final shakedown of my gear and bike before the "big trip". This is a quick chronicle of last weekend's ride, as well as a chance to acquaint myself with posting here on ADVrider, as I plan to use this forum for my longer ride report as well. 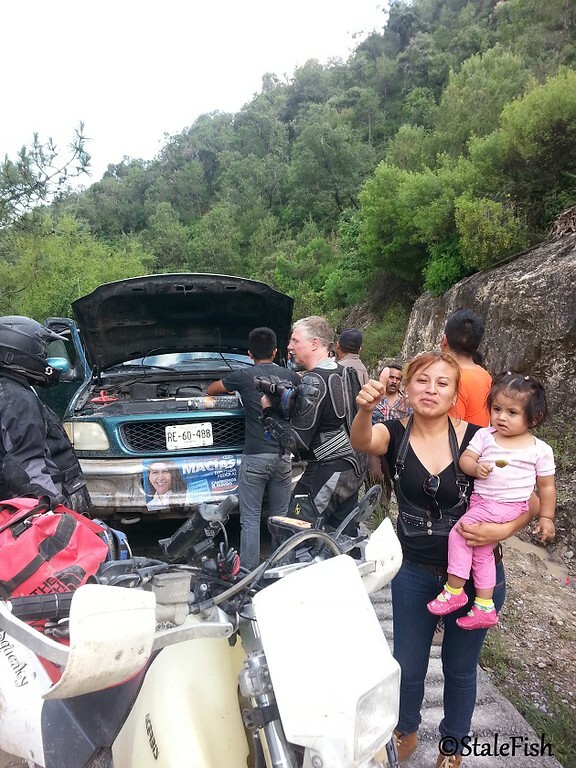 The plan was to meet everyone at the border and ride down together. The other guys had met up the night before (none of us had ever actually met) at a local hotel near Mercedes, Texas. They did their paperwork Thursday night at the Pharr border crossing so they would be ready to go Friday morning. I, on the other hand, had some last minute plan snafus, and ended up driving most of Thursday night. I got to the McAllen airport long-term parking lot around 5am Friday morning. After about 45 minutes' nap in the truck, I unloaded and geared up, then rode to the Anzalduas Bridge. When I got to the Mexican side of the bridge, there was only one person ahead of me in the immigration line. I was able to get through immigration and customs in about 40 minutes, including my TVIP paperwork for the bike and my tourist card. This crossing is nice and easy access, as it basically bypasses Reynosa instead of having to go through the border town. I waited a while in the parking area at aduana for the other guys to show up. 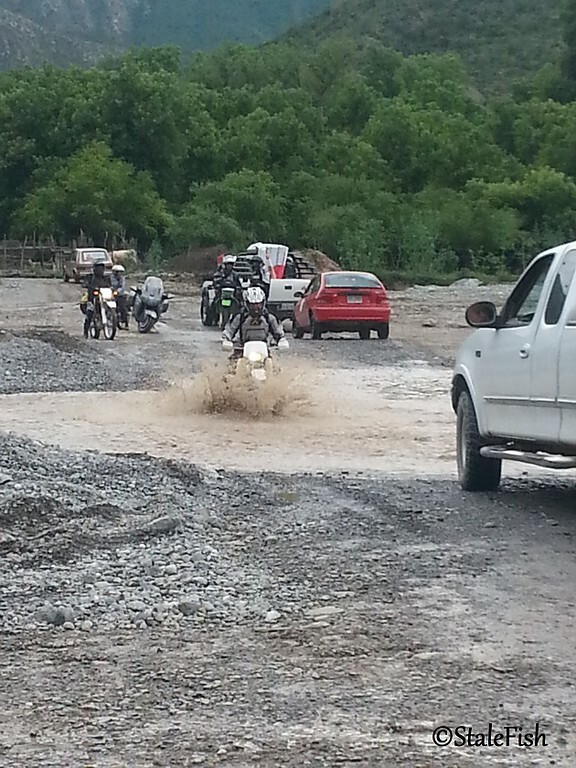 Just as I was beginning to question whether they had taken a different crossing or had run into problems before getting across the border, up rolls my weekend riding buddies: an XR400, an XR650, a KLX400, a WR250R, and a Kawasaki Concours! Ok, Thomas and his Concours was sticking strictly to the pavement, but he agreed to slow down for my little XT250 on the long, straight road down to the mountains of Northern Mexico. 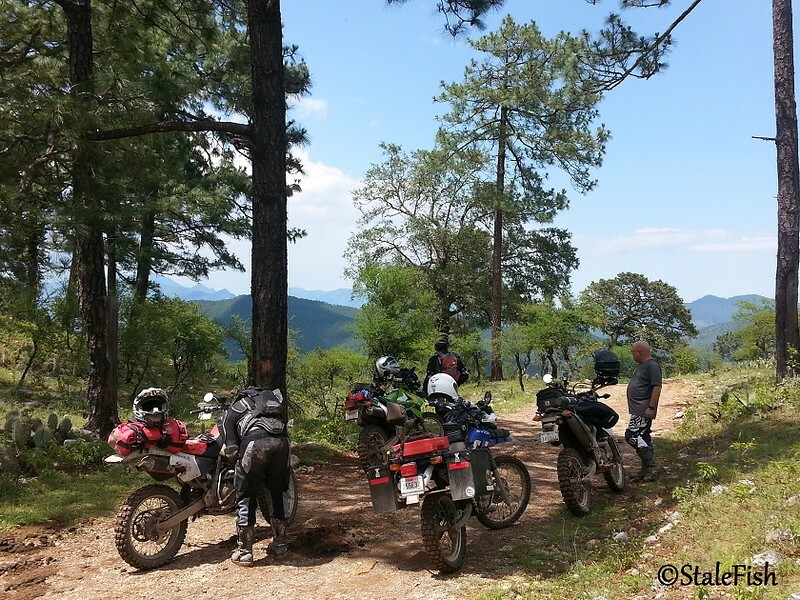 Thomas had joined us for the ride to Galeana, and was planning to head further south the next day. Our first stop after leaving the border was lunch in General Bravo, a small town on the way towards China. Check out the size of the rear box on the 125 moto on the left. Most all of it hangs out behind the rear axle. That thing has to be a wheelie monster. While there, one of us (Zeke) ran into some old friends who lived in town. 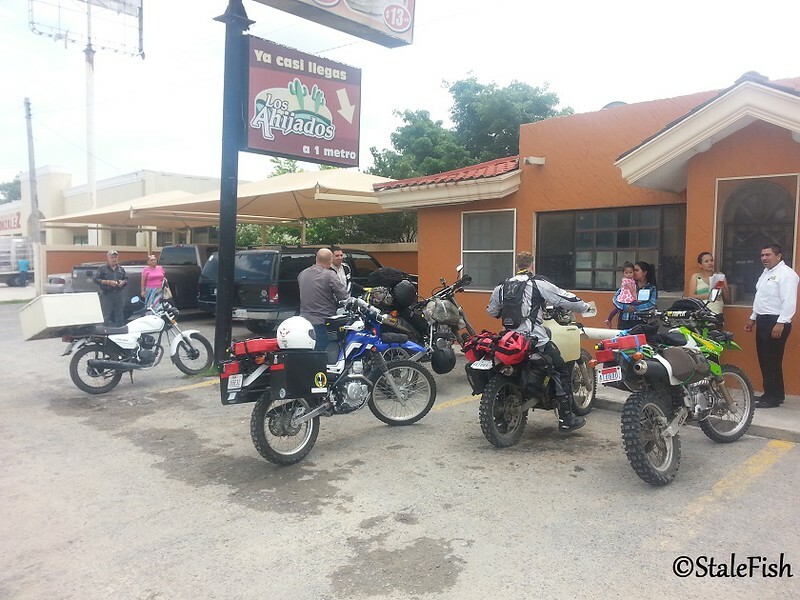 Bodies refueled with some great Mexican cuisine, we continued south on the libre towards China and Montemorelos. This is a fairly (okay, very) straight road for miles, without a lot of scenery except in the towns you pass through. But we all had anticipation of seeing the mountains in the distance and it wasn't long before we were closing in on Montemorelos. 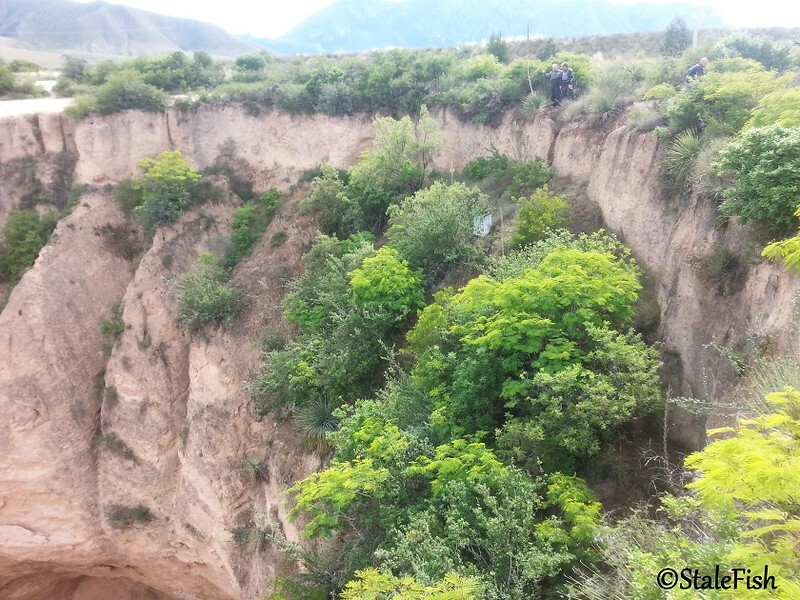 The landscape became greener, trees appeared, and in the distance were the mountains we had come here for. 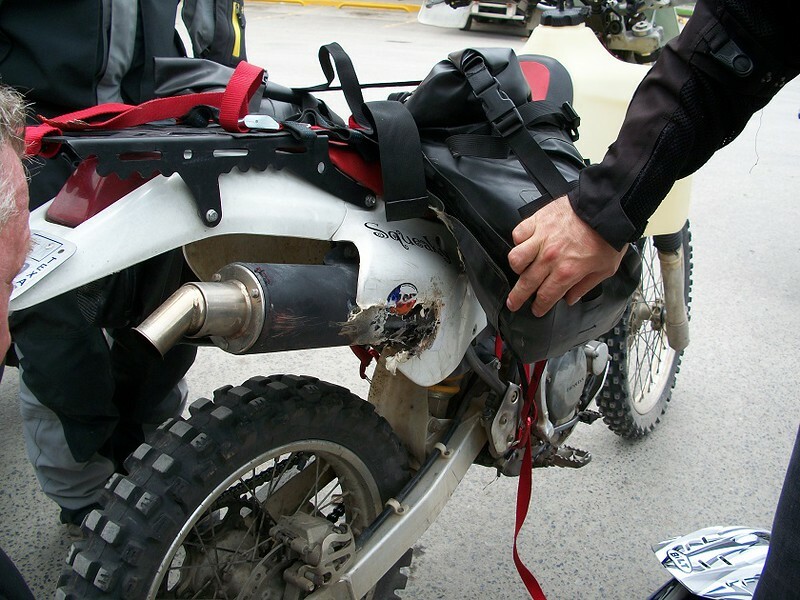 We stopped for fuel in Montemorelos, and Philip noticed that something wasn't quite right on the back of his bike. One of his luggage straps had failed, and the weight of his bag had pushed his side plate into the muffler, melting it away and nearly melting through the bag. Fortunately, no serious damage and no fire. A few strap modifications using a spare strap and we were off again. We decided to take the dirt road into Galeana from Rayones, but the road up to Rayones is paved (mostly -- if you ignore the potholes) so Thomas joined us on his Concours with the intent of turning around at Rayones and heading back down the highway to Linares and then up the paved road into Galeana. The guy just can't get enough of pavement twisties. We had a great ride up the mountain. 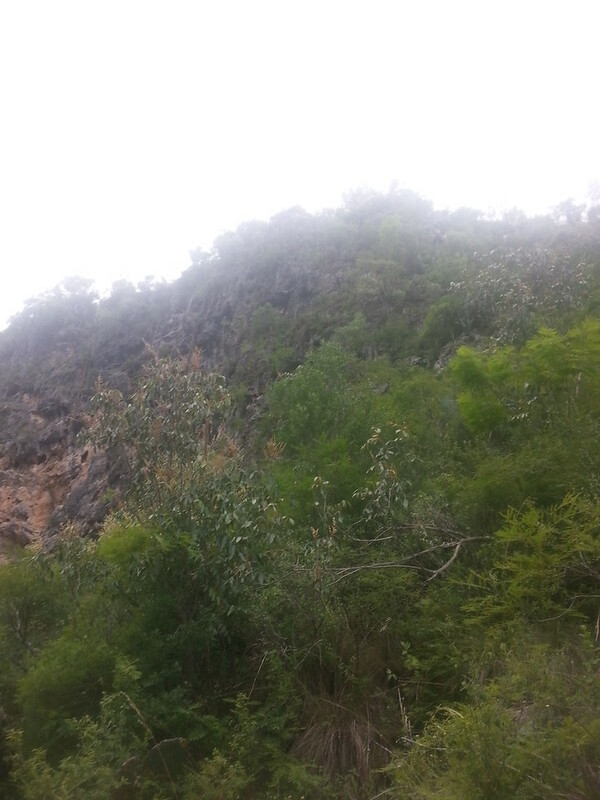 The clouds were low, but the weather was great and it cooled off as we climbed. At the turnoff to Rayones, we decided to run into town and grab a cold drink. They're building a new bridge across the river, but it's not quite finished yet. The water was actually flowing pretty fast, although you can't see it in the photos. In the background, you can see Zeke and Thomas having a brief discussion...something to the effect of "Are you F'ing nuts? I just got to Mexico. 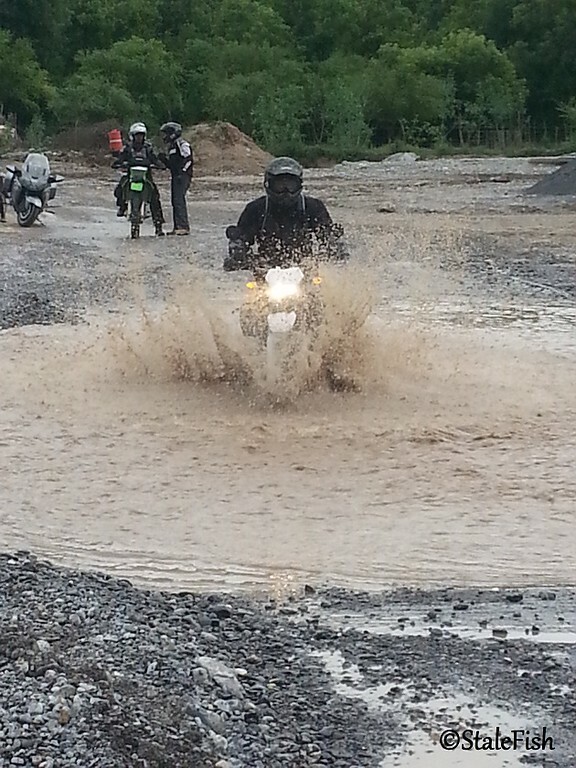 I'm not riding my sport tourer across that. My trip just started. I'm not ready to end it here." I was actually glad Thomas decided to turn back at this point, because if he had crossed the river, we were only going another mile or so into town, then we had to go BACK across the river again to continue to Rayones. He definitely would not have been happy to find that out after crossing. 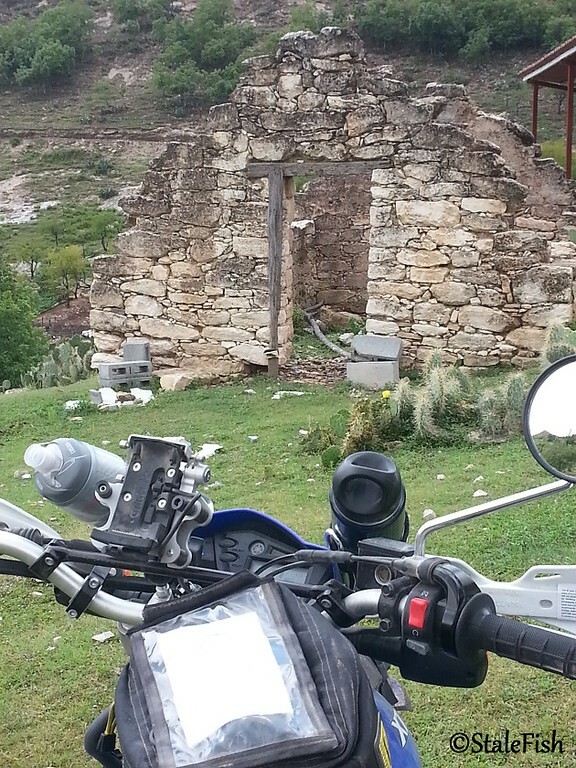 The last 14 miles or so into Galeana is dirt road and good scenery. We were going to be doing this stretch several times over the next few days, so I didn't take any photos today, as we were all tired and ready to get to the Magdalena hotel and have dinner and cervezas. Having slept a total of about 2 hours in the past 36, I was definitely ready. After a round of breakfast tacos delivered to us in front of the hotel by a young entrepreneur, we headed out to do a clockwise version of the "Top of the World" loop mentioned in the MexTrek guide book. 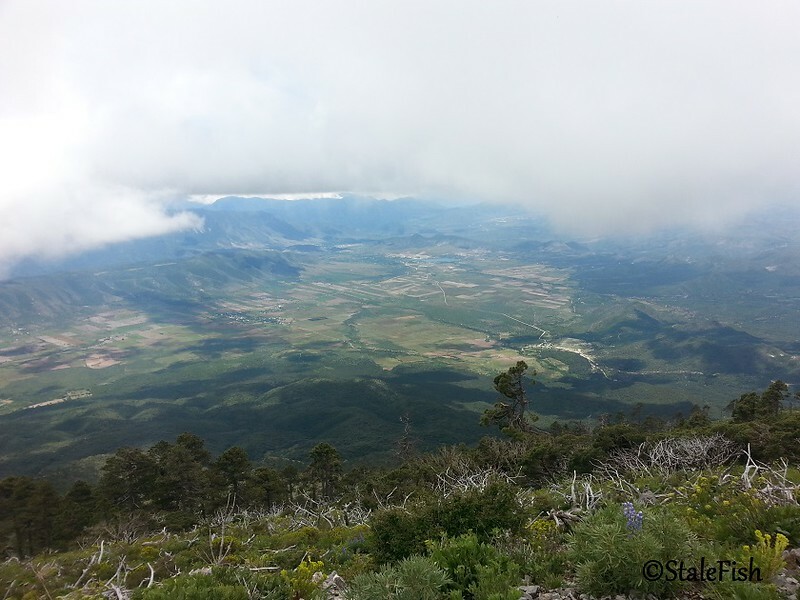 Since the skies were clear early in the morning, we wanted to get to the top of Cerro Potosi while there was a clear view from the top. 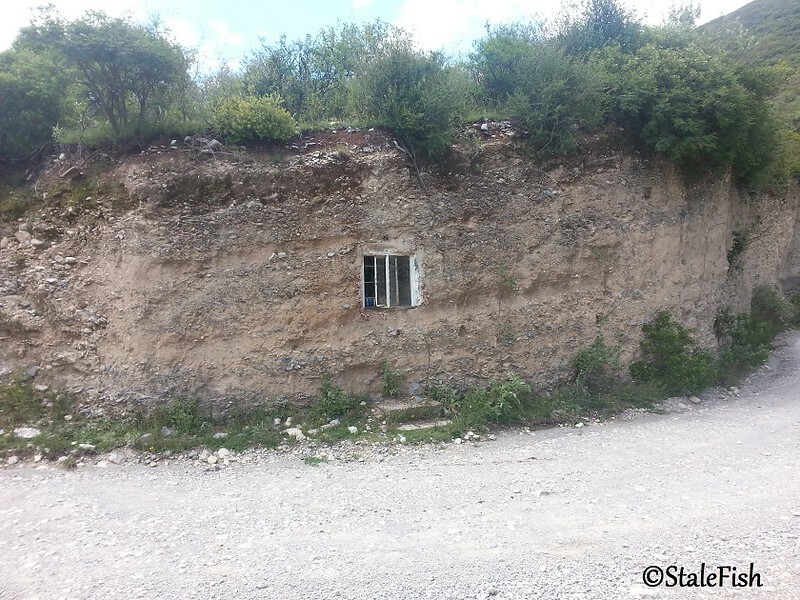 We stopped short of the village of Dieciocho at the Pozo del Gavilan. 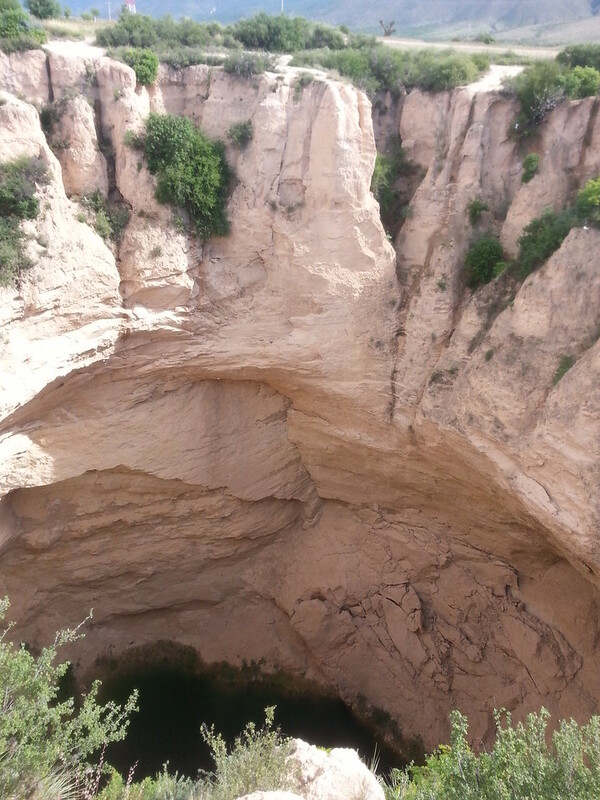 This large hole in the ground is over 200 feet across and nearly 270 feet deep. The climb up to the top of Cerro Potosi is almost entirely hand-laid cobblestone. It's incredible just to think of how long it had to take to set all of those stones for miles and miles of road up the mountain. I had read that the road up the mountain was one of the worst roads you would ever ride, but it didn't seem that bad to me. Sure, it's a lot of bumpy rocks, and I suppose if you're limiting yourself to "roads" by definition, it's rough, but I've definitely ridden a lot worse trails in the Rocky Mountains of Colorado. Maybe not consistently made up of rocks that don't move for miles and miles like this road is. 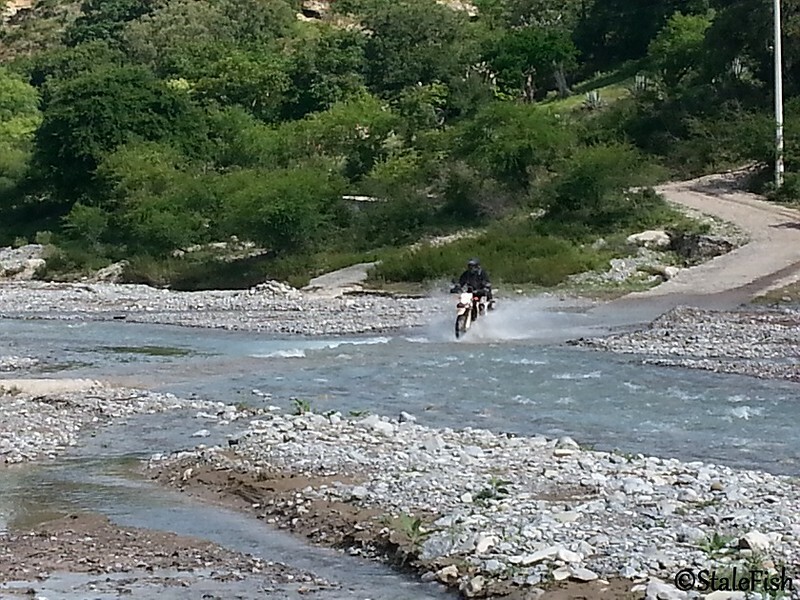 I suppose it's all subjective, and a lot depends on the choice of bike, the rider, and the frame of mind. 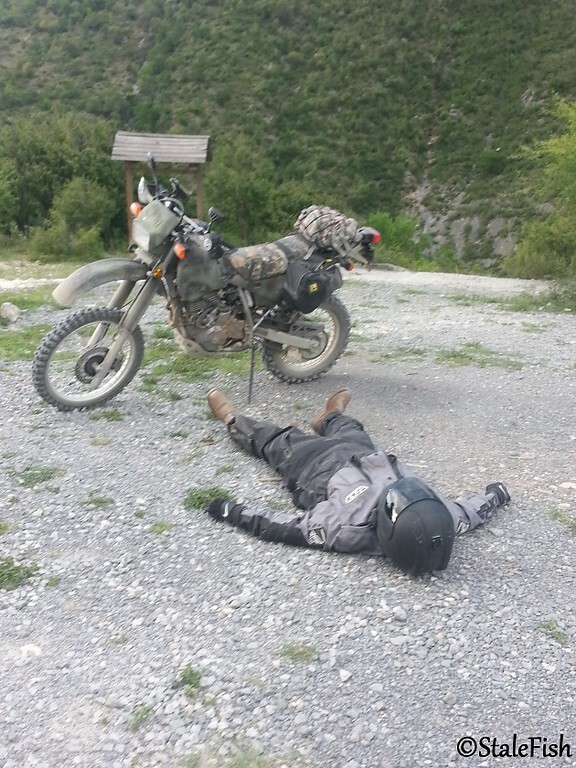 I probably wouldn't have the same opinion had I gone up it on my Super Tenere. The views from the top at over 12,000 feet are spectacular. Not long after we arrived the clouds started rolling up the mountain until we were in a blanket of white. On the way back down, we popped out of the clouds and it began to warm up again. 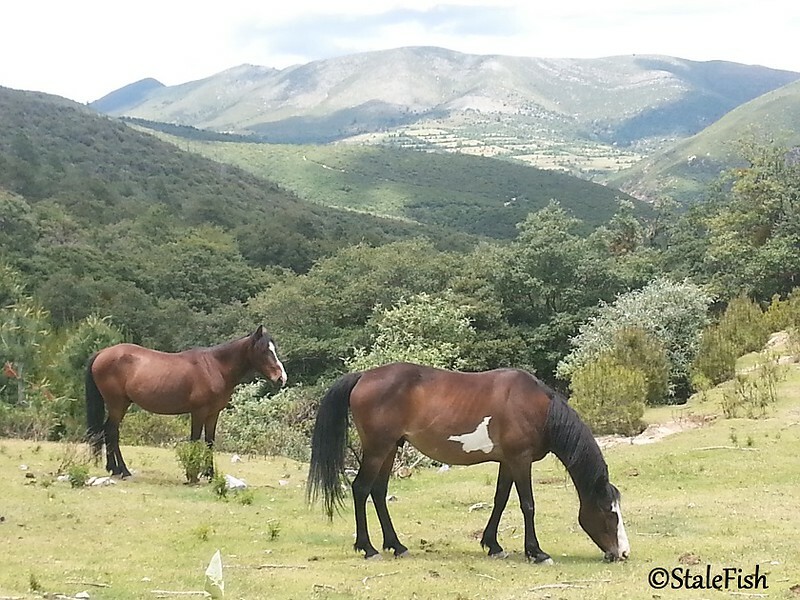 At one point these two horses ran across the road and began grazing in a beautiful spot on the side of the mountain. 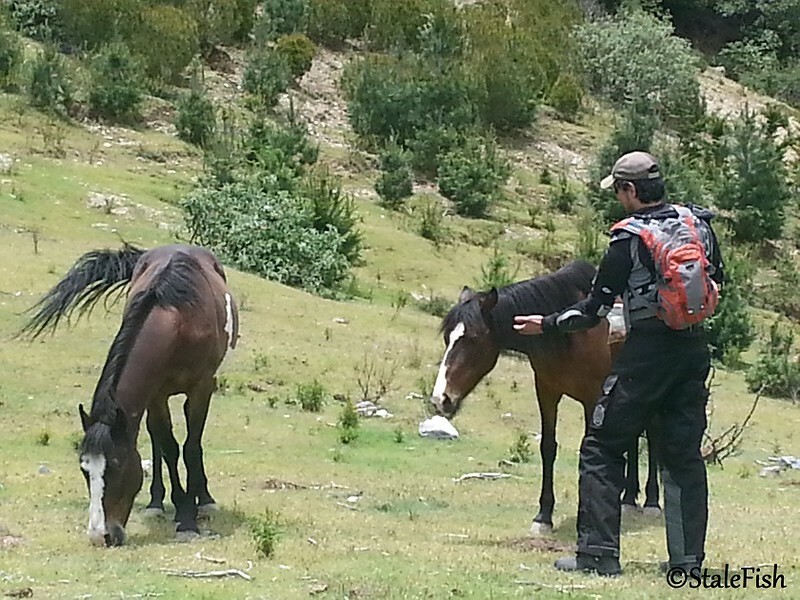 They didn't seem bothered by us, and Zeke actually fed one of them some trail mix. We stopped at the bottom of the mountain at Dieciocho for a coke and some pan, then set off for Mimbres and Cienega del Toro. The entire way we met friendly people and lots of children who were reserved, but curious about us. 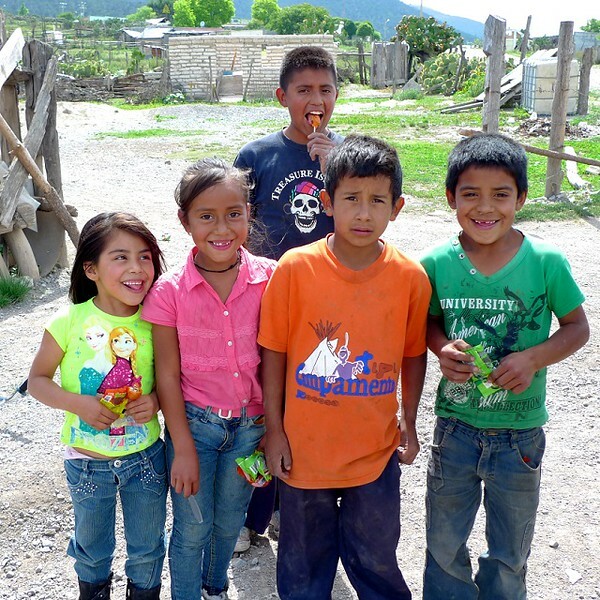 Doug and Philip brought some snacks for the kids in Cienega del Toro. Another thing we noticed as we rode through these relatively remote tiny villages is that even out here in the middle of nowhere, the girls and young ladies were well dressed. 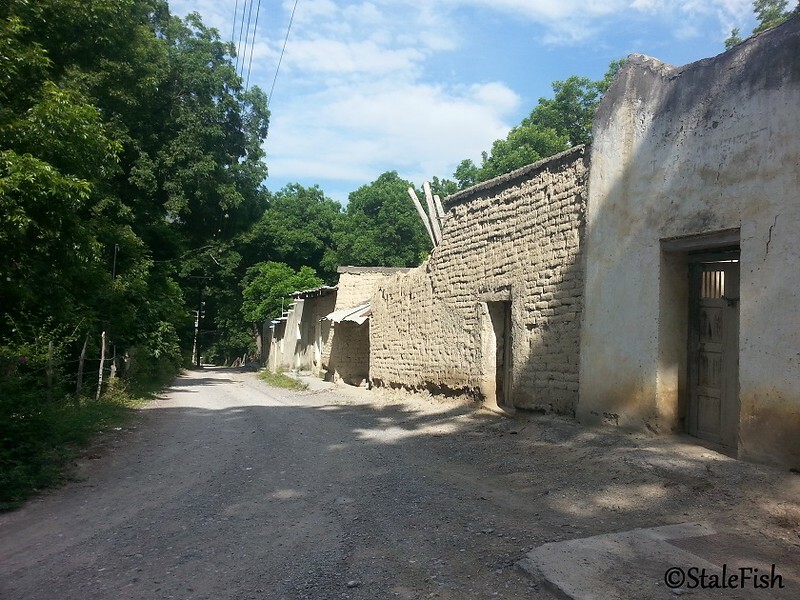 There's no establishments to hang out at, no shopping mall, no place to cruise (and nothing to cruise in), not even a piece of pavement, and there's very few people in the entire village. Nobody to impress really, but they still care about how they look. Cienega del Toro sits in a high valley and from here it's all downhill to Santa Rosa, then south into Rayones where we again cross the river to take the dirt road back to Galeana. A shrine built into the side of the hill...almost looks like there should be a house in the hill. There's even a set of steps built so you can step up and look in the window. 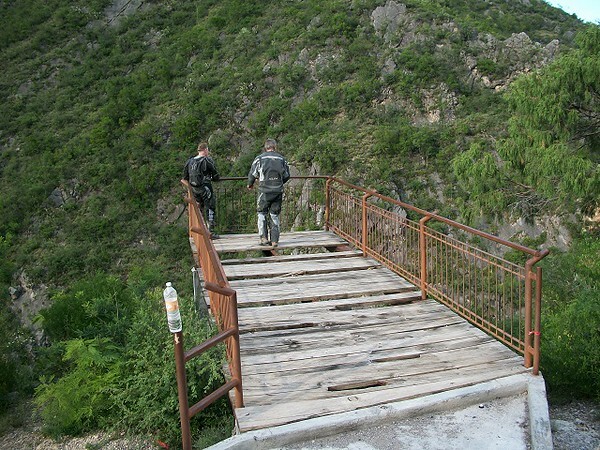 On the way back to Galeana we stopped at Puente de Dios. I had ridden past this spot multiple times and never stopped....from the road it just looks like a small picnic area with some tables. 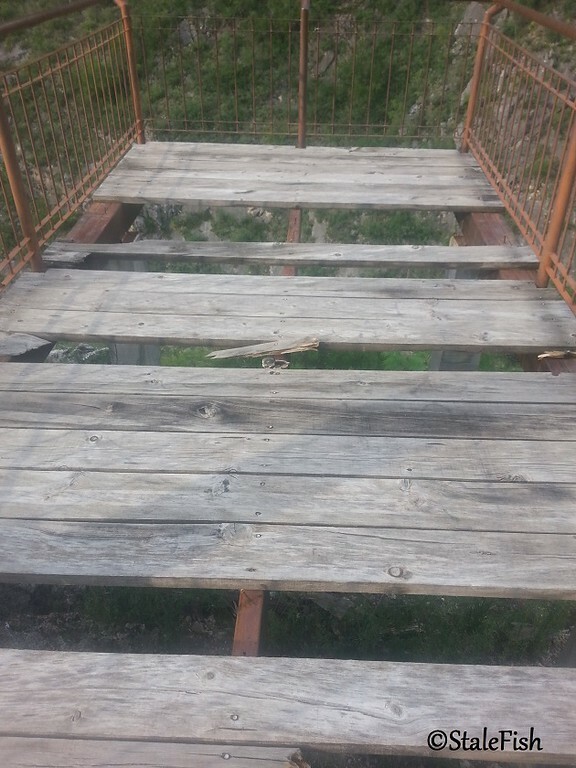 I had seen the viewing platform extending out over the canyon, but I thought it was just so you could get a nice view of the canyon. I had no idea. Fortunately Zeke knew about it. When we pulled in, Doug was feeling a bit overheated from the long day's ride. Looking back up at the viewing platform. If you look really close, it's at the center top of the photo. 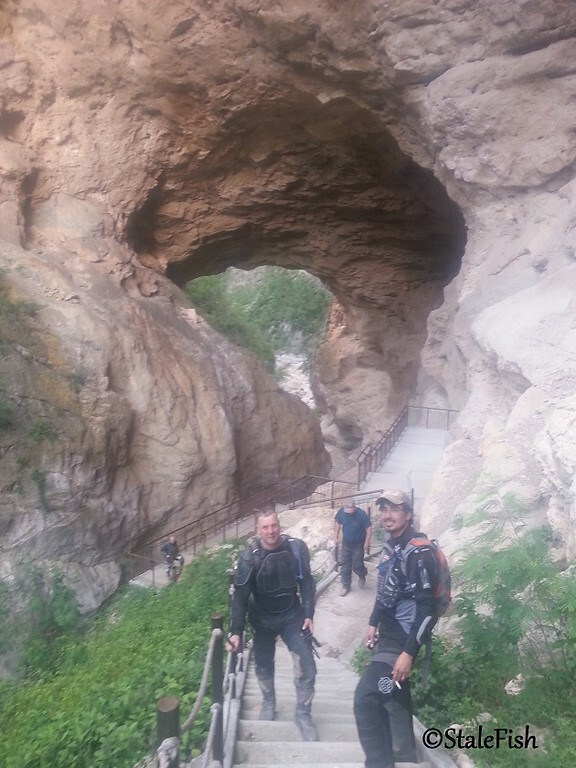 This is a natural arch with the river running through it and some small falls, and the road we've been riding to Galeana runs over the top of it. I had no idea. Very cool. We made it back to Galeana a bit before dark, and had another great meal at La Casona de General. I highly recommend this restaurant. We discussed plans for Sunday's ride, but decided to wait until morning to decide on a route. Great write up - subscribed! Super ride with you guys and great ride report ! Our route this day took us south of Galeana, following the "Buena Vista" route in the MexTrek guide. 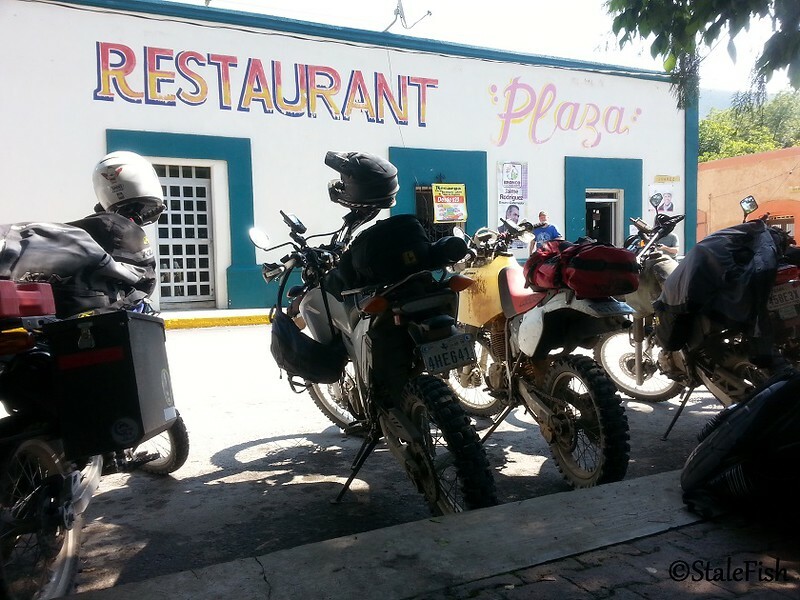 We rode the highway down to Iturbide and had breakfast on the square at the Plaza Restaurant. 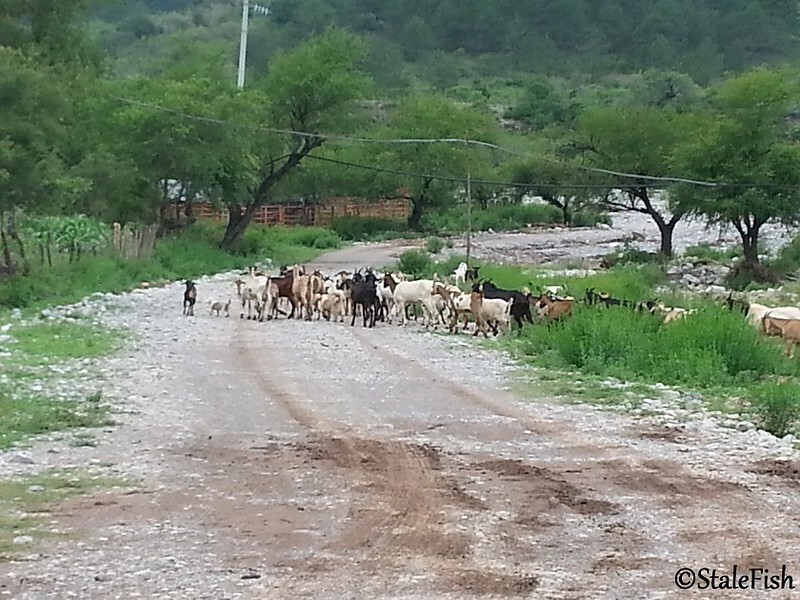 We continued south to the village of Camarones, where we ran into a real traffic jam. 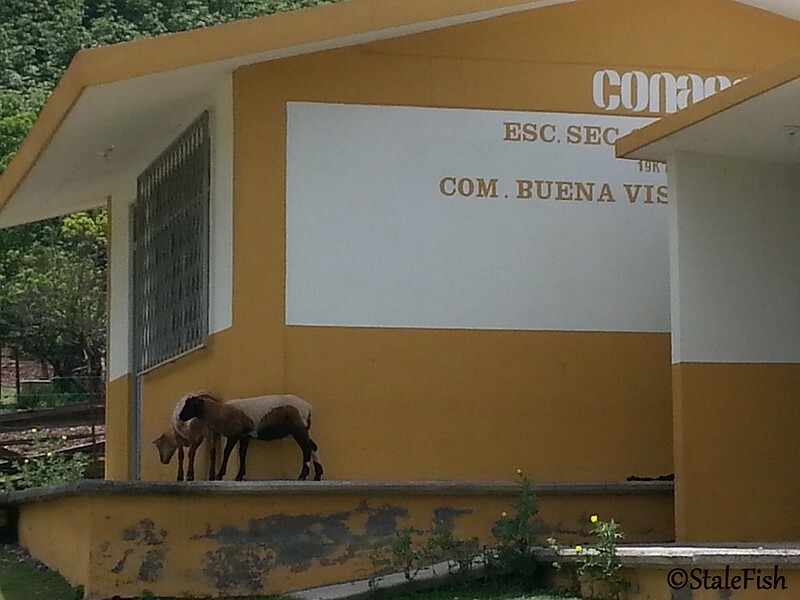 Turns out, elections are coming up soon, and the PAN party was having a rally in Camarones today. Everybody from all the villages around was there, and pickups blocked the road. Rather than cause a scene and try to work our way through the crowds, we decided to just join them. There were several speeches, and a mariachi band. 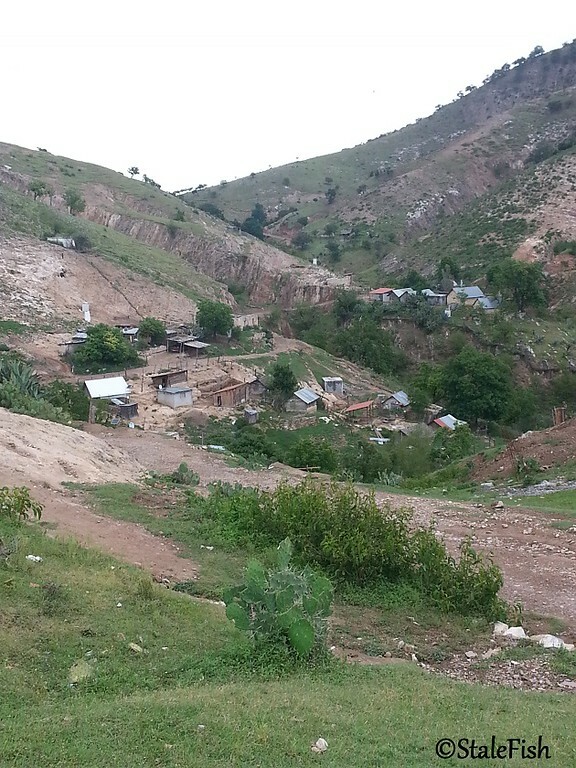 Eventually enough room cleared for us to get through, and we headed further south to the tiny village of Santa Inez. This is a truly remote village, and the road out to the west and back north didn't look like anyone with wheels had been on it in quite a while. It was grassy, muddy and slick, but we were able to slowly make it through to some harder ground. At one point we were a bit unsure if we were on the right road, since it was covered in grass and unused. We ran across a local and asked directions. Eventually we made it up to the old sawmill town of Buena Vista, where we saw a couple of kids hanging out in front of the school. Buena Vista was definitely named right. The forest here, mixed with cactus and beautiful views, makes for a great spot for a break. After Buena Vista, it was downhill and north to La Purisima, where we got our first hint of rain, though it didn't last long. 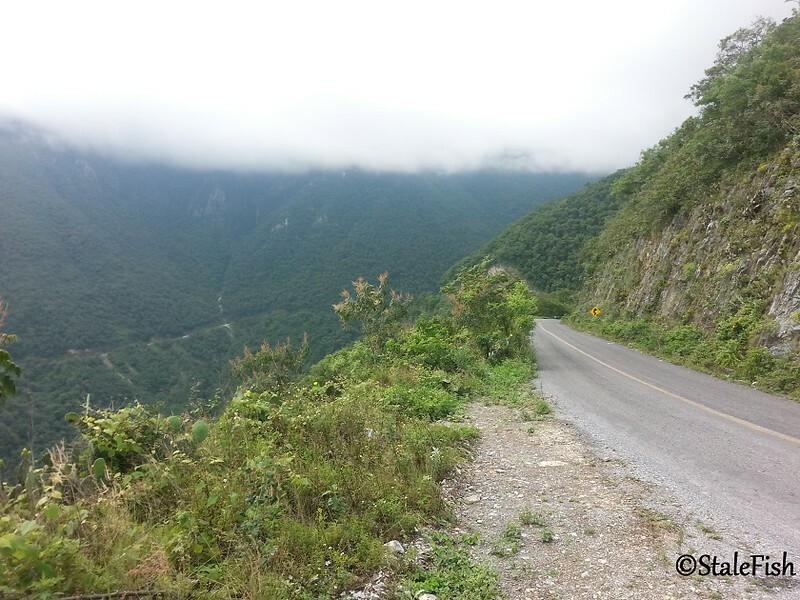 The road looped back to Cuevas again, and we turned left and started climbing back up to Iturbide. 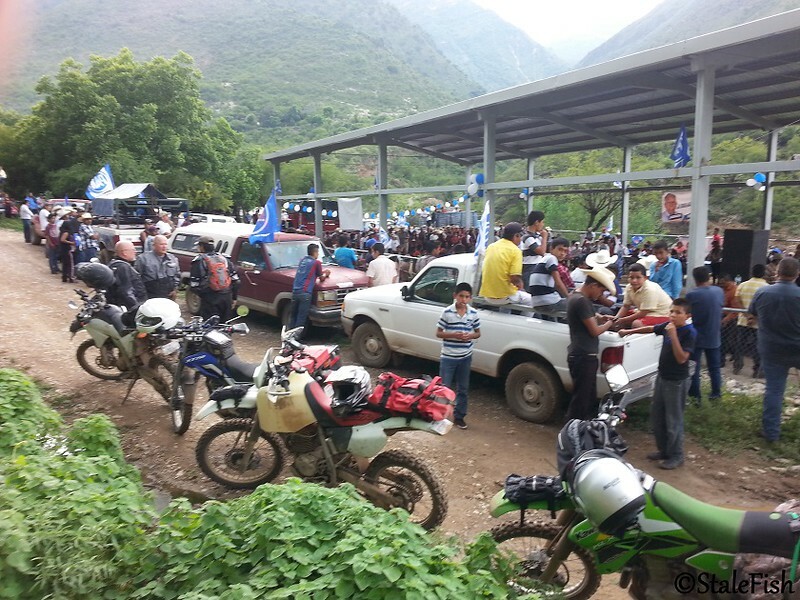 On the way up, we started meeting some of the people in trucks from the political rally in Camarones. On one uphill, we came across two trucks stopped in the middle of the hill. One of the trucks had overheated. We all pitched in what water we had left in bottles and Camelbaks, and were able to get them going again. It was good to give a little positive PR for the gringos on motos, and they were definitely appreciative. 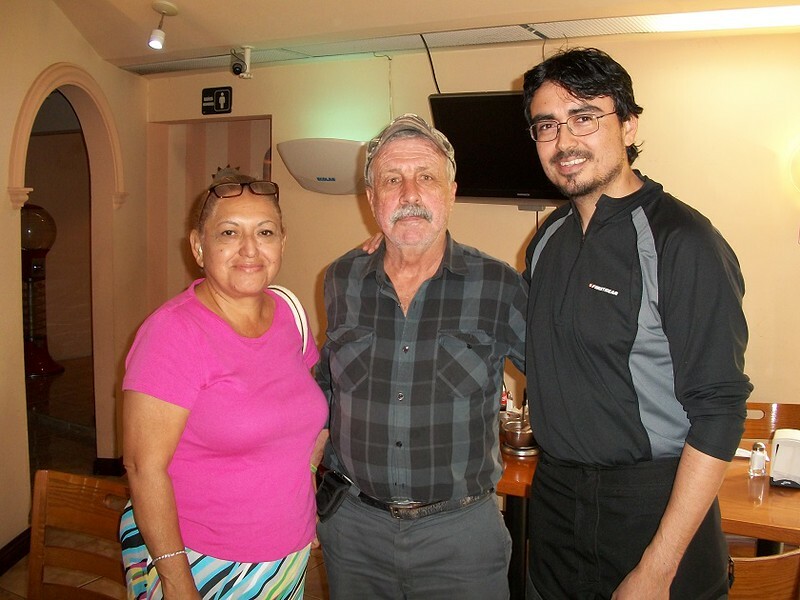 Back in Galeana, we enjoyed another great meal and some Tequila ice cream afterwards. Yep, tastes like tequila, only better. 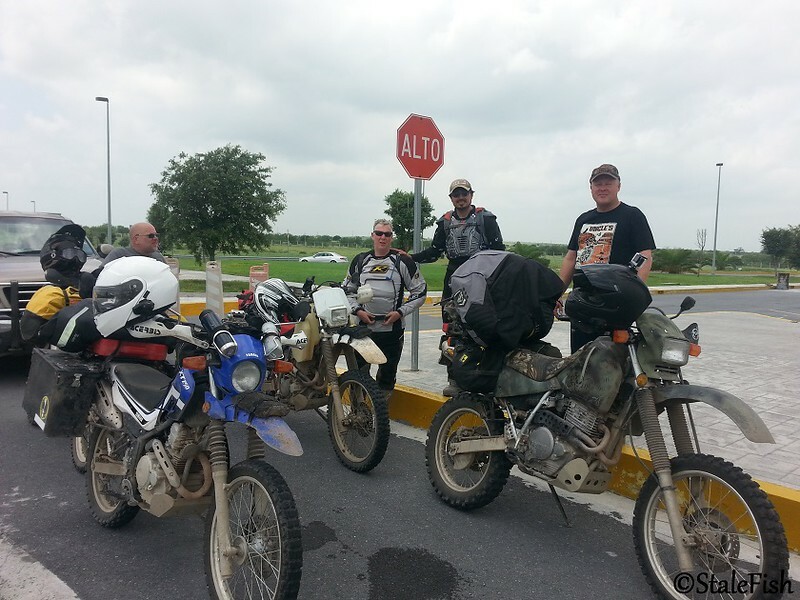 And we met John from Alabama who had just rolled into town on his GS and was headed for Guaymas. Time to head home. It's hard to leave this beautiful place, especially after only a couple of days exploring. There's so much more here, and we haven't even begun really. The other guys on this ride are likely headed back in October for MexTrek. While I wish I could join them, I hope to be somewhere around Panama by then. Thanks guys for a great time. It was too short, but we saw a lot for the time we had. Hope to catch up with you again in the future somewhere on two wheels. Great riding with you PW. Good luck on your RTW. Can't wait to hear about it. Great job Pat on your first adv ride report. This memorial weekend mek trek with a group of guys that I though did not know personally, my gut said they are just crazy enough like you, to head to the unknown in search of adventure, that adventure that makes one feel alive. And it did not disappoint, thanks guys, as the Brit says, it was brilliant. 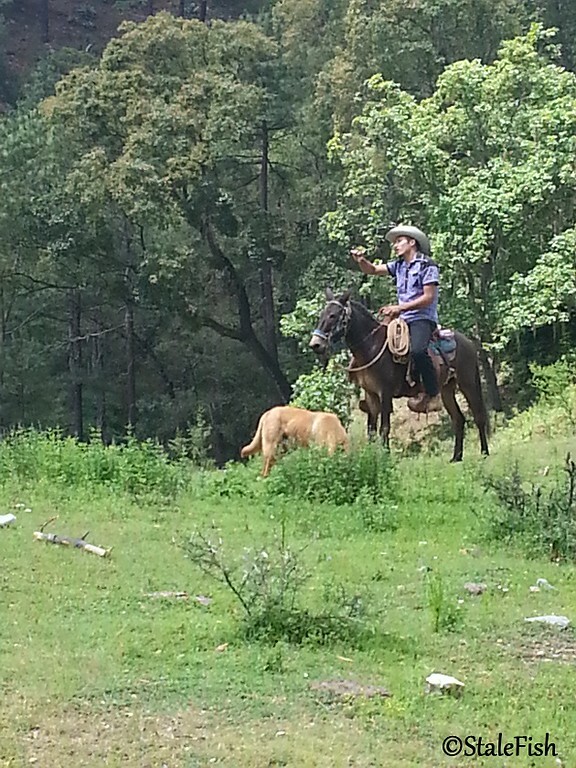 Report brought feelings of nostalgia about riding La Sierra Madre in years past! Great report. I'm glad the tradition continues! Thanks, surely I'm trying to, it had been 5 yrs 4 months since my last mex adv with daniel villarreal, but now we are OKed for TAKEOFF, i finally found crazy enough guys to go with, after looking at your rr list, it looks like we missed each other by 2 months, my first ever mexadv was march 2008, cheers.